How the Democrats can play hardball with Trump’s Supreme Court nominee. 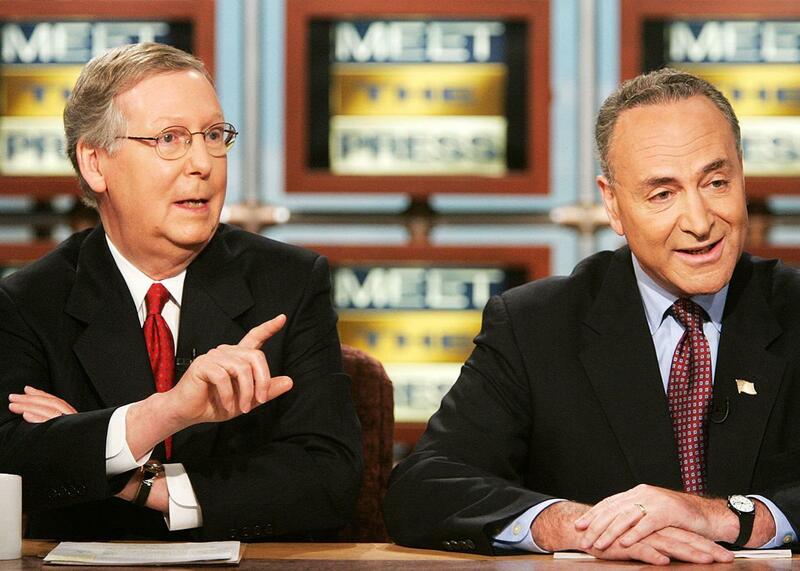 Mitch McConnell speaks as Chuck Schumer listens during a taping of Meet the Press on July 2, 2006, in Washington, D.C. They’ll be seeing a lot of each other again these days. Last week, after nearly 300 days of Senate obstruction, Judge Merrick Garland’s nomination to the U.S. Supreme Court expired. President-elect Donald Trump says he plans to seat a new justice, who will be avowedly pro-life, by April. He plans to name that person within two weeks of his inauguration. Senate Minority Leader Chuck Schumer recently explained on MSNBC that Democrats in the Senate plan to block any Trump nominee who isn’t in the mainstream. And Senate Majority Leader Mitch McConnell has responded by warning, evidently without irony, that Americans will not tolerate such obstruction. Since the Supreme Court vacancy occurred, Democrats have been struggling with how to negotiate with opponents determined to win at all costs. When norms of good faith collapse, what does playing hardball even look like? Many progressives are upset that President Obama didn’t surprise us all with a recess appointment last week and are wondering aloud how you can go high when they go low without being kneecapped. Hal Movius has taught negotiation for two decades to undergraduates, MBAs, executives, and CEOs. In his new book, Resolve: Negotiating Life’s Conflicts With Greater Confidence, Movius explains that we shouldn’t be afraid of conflict in negotiation, that it can actually produce good outcomes—but only if we can be smarter about it. I asked him to help walk me through the pitfalls and opportunities for Democrats attempting to negotiate and govern at a time when such negotiating will happen from a position of total weakness. This interview has been edited and condensed for clarity. Dahlia Lithwick: One of the things you have thought about is the relationship between cooperation and confrontation in negotiations. I think the concern Democrats have raised with me during the transition lies in the tension between those values: President Obama and the Democratic leadership are interested in an orderly transition of power and in good governance. Their opponents seem bent simply on seizing and deploying power. Is Democratic leadership just, well, doing it wrong? Hal Movius: Liberals have a strong universalist impulse, an urge to be connected to other people and to the planet. By nature they are attracted to agreements by consensus. Republicans, as Jon Haidt has shown, are more tribal and “groupish,” more comfortable with walking away or stonewalling, and with purity tests (like “no new taxes” and more recently, Trump’s list of exclusively pro-life [potential] SCOTUS nominees). The word compromise can rile them, because it sounds like a betrayal of principles rather than a flexible, pragmatic tactic. It’s important for Democrats in leadership to recognize their preference to be inclusive and reach across the aisle but also to think hard about whether the goal of “getting to yes” is more important than achieving the most important objectives of their constituents and party, which might be better served by walking away. Any effective leader or representative can benefit from learning how to think like a negotiator. This starts with a careful analysis of the situation they face, thinking hard about what each party stands to gain or lose by putting forward a proposal or saying no to what is on the table. What does each party think it can achieve through other means, in the event of impasse? It also means learning how to frame the context for negotiating. Rather than reacting to whatever the Trump administration does, Democrats should work hard now to articulate a set of principles that will govern their consideration of any nominee. Will this person protect civil liberties? Make democracy and elections more free and fair? Protect the health of all Americans? That needs to be the message and not just “[he or she is] out of the mainstream.” (Nobody knows what that means). Trump is a classic hard bargainer, which in the long term may prove a major limitation for him and the GOP, and has predictably taken an extreme position by announcing that he will only nominate someone from a preapproved list, with a predetermined view of Roe v. Wade. Democrats ought to respond with their own hard position, rather than offering an olive branch: We will only vote for someone whose stated beliefs and judicial record reflect the views and values of all Americans, not some; no one on the current list has a chance of being approved. Positional bargaining is sometimes a necessary first step toward helping a competitive counterpart understand that their win-at-all-costs tactics won’t work; a different approach will be needed. So did Schumer disadvantage himself by suggesting that Senate Democrats would, for instance, only obstruct the far-right nominees? That’s a “softer” position than, say, John McCain’s “no Clinton nominees for all four years” posture during the election. How do we recognize when norms of good faith have expired and that collaboration is pointless? Well, it’s not so much whether collaboration is “pointless” but whether it is still the way to get the best possible agreement for their constituents. Again, for liberals, being collaborative is a natural instinct and a desideratum, but if collaboration means “giving in” and getting an outcome that is unacceptable, then other tactics—forming a blocking coalition, seeking to persuade adversaries, framing the narrative in the media, firing up the base—may be more effective. Leaders and negotiators sometimes walk into situations in which they are doomed to reach a poor agreement and get blamed for it later, because they let the other side “anchor” them on an extreme starting point or story. If you offer to sell me a hot dog for $100 and then give me 80 percent off, telling everyone how generous and flexible you’ve been, it’s still a ridiculous and indefensible proposal. I would be better off ignoring your starting point and narrative and clearly stating my own. Everything I know about negotiation suggests that if you are a repeat player engaged in long-term relationships, you tend to be more careful about burning bridges. But we are seeing very little of that kind of caution at work in the present moment. Should Senate Democrats bargain as though this moment is frozen in time or as if whatever tools they use now will come back to haunt them in future? I am thinking specifically about the use of the filibuster. In the new media environment, something may be “outrageous” or “unprecedented” today and more or less forgotten tomorrow. Political memories are shorter and shorter. Merrick Garland’s treatment is a good example. In this environment, avoiding harmful precedents can be one interest or goal among many. How important is that goal relative to others? And framing is also important: Why are we taking this action? What is the principle at stake? Ever since 1994 when Newt Gingrich ran on the “Contract With America,” Republicans have frequently claimed that their actions were protecting “America” or “real Americans.” Democrats would be wise to reclaim that language instead of ceding it to the GOP. As difficult as it is to be confronted with counterparts who are using ultimata, threats, and other hard-bargaining tactics, there is an enormous benefit to remembering that you are working on behalf of others, and on behalf of what you believe. For example, research has shown that women negotiate smaller rewards for themselves than men do but are no different from male negotiators when negotiating on behalf of others. A final important insight is this: While behaving ruthlessly in cooperative settings will burn bridges, that’s perhaps less true in environments where adversarial tactics are expected. A generation ago, when congressional representatives lived and socialized together across party lines, and when the House speaker had earmarks to use as rewards or punishments, the consequences of extreme positions or incivility could be severe. Today, there are (regrettably) new norms that govern congressional relationships, ones that emphasize fealty to one’s base. Until we change our gerrymandered districting system, it may be necessary to use hard bargaining tactics while continually emphasizing the benefits of “changing the game” to a different approach. It will take courage and small reciprocated steps by senior leaders, probably behind closed doors, to help build stronger cross-party coalitions. Unfair question: Should President Obama have done something different in this transition? Should he have played hardball? Should he have used every tool of confrontation in his power to protect his legacy? Immediately after the election, I imagine his main goal was to reassure the country and our allies. Many Americans and probably all U.S. allies had assumed Clinton would win; based on the polls and Trump’s nativist statements, they were alarmed and confused in the days after the election. What did this outcome mean? Can we count on a president-elect whose behavior seems erratic, hostile to immigrants and multilateral institutions and diplomacy? For that first week, Obama probably wanted to ensure that the world saw an orderly transition and that democracy would not fall apart. To some extent he succeeded. With the revelation that Russia intervened systematically in the election, possibly determining the outcome; with the still-unknown extent of his debts to Russian creditors; with the daily evidence that our president-elect seems to have greater faith in Putin than his own intelligence agencies: Here were have, to put it mildly, an unprecedented situation. So what Obama knew and when he knew it with respect to hacking and disinformation will be a critical subject for future scholars. But I think this is not his moment to fight. He is trying to consolidate the narrative, summarizing the progress of the last eight years, as a marker. He will be back. He will continue to be a voice in our public life. But in the short term, others must take up the cause and summon resolve.